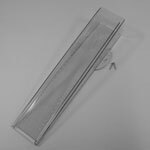 The 260-2531 Plastic Rain Gauge measures up to 11" (280 mm) of precipitation and is made of clear, tough butyrate. The internal measuring tube, with a capacity of 1" (25 mm), is graduated to 0.01" or 0.2 mm. A sturdy, rust-proof mounting bracket is included with the gauge. 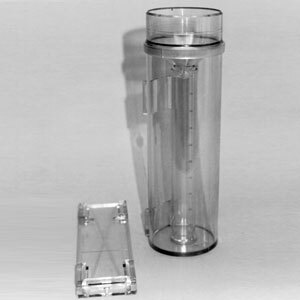 The 260-2531 Plastic Rain Gauge measures up to 11" (280 mm) of precipitation and is made of clear, tough butyrate. The internal measuring tube, with a capacity of 1" (25 mm), is graduated to 0.01" or 0.2 mm. 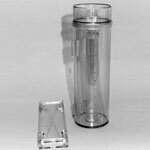 Precipitation greater than 1" overflows into the outer cylinder and is measured by pouring into the measuring tube. The receiving funnel and measuring tube are removed for collection of snow. A sturdy, rust-proof mounting bracket is included with the gauge.